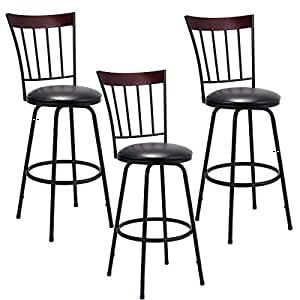 This is our brand new counter height Bar stool, which will offer you or your guests a comfortable seating experience. Made of Powder-coated heavy duty steel and waterproof and Anti-aging PU leather, it provides you years of durable and reliable use. It Has An Ergonomic Back Design and Sponge-filled Cushioned Seat, which Makes It Stylish Yet Comfortable At The Same Time. Plus, An additional circle footrest add more comforts for you. Don’t hesitate to buy it now!